What are the Best Font for a Resume? Applying and getting a good job start with the right arrangement of resume where the font plays an important role. The days of using Times New Roman as your CV/Resume font is gradually fading off which means more and better resume are required. Using a bad font for your Resume or CV as popularly called can discourage the interest of the reader which may likely be your new employer. Someone said 'the best resume/CV is the one that can be read with ease." We decide to compile a list of best font that fit in for a CV or Resume. 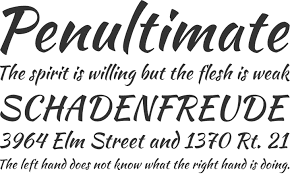 Unlike the times new roman which has its days fading off and coming to the end. 1. Arial ; This font is a much more better than Times New Roman and its been described as a Neutral font. Arial is clean, neat and easy to read at any time. 2. Garamond; Garamond is one of the best font recommended for a Resume/CV. Garamond is readable and its also one of old font used by many people around the world. 4. helvetica ; I have seen many resumes online and offline and a highly level recruiting official once told me that Helvetica is a good font to use when building a resume for jobs. This font is mostly used even in my place of work right now for official documents. For the best Resume, get a very good fonts on your Microsoft Word like the once listed above. Thanks for reading.